A pair of reception area bespoke aquariums installed in the lobby of a Leicestershire publishing business. 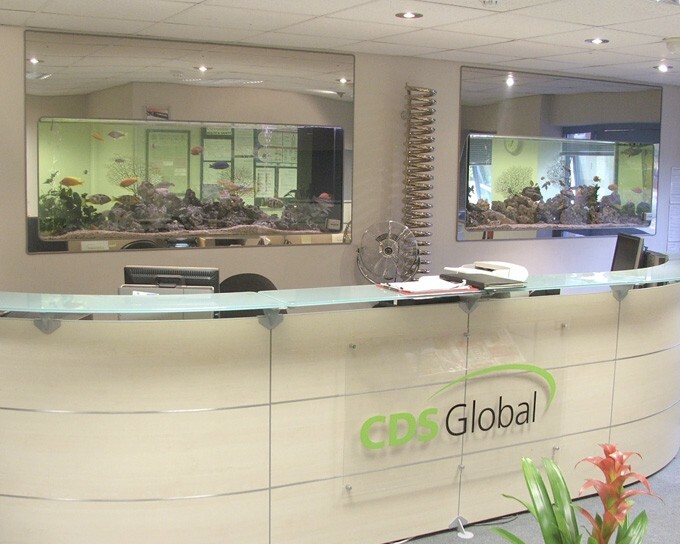 These tropical aquariums perfectly compliment the refurbished reception area and help to create a stunning first impression to visitors and clients alike. Both aquariums house a variety of cichlids which have been regularly breeding since their introduction. We have used ocean rocks and coral sand in both aquariums, these provide a perfect environment for cichlids as they love hard water and the nooks and crannies in the ocean rocks allow the young fish to hide out until they are big enough to swim with the adult fish. Both aquariums have a pair of external filters in the cupboards below which are connected to a 30 watt ultraviolet steriliser to keep the aquarium water clean and clear.